From bright, bold tropical flowers to cactus plants in bloom, flowering house plants are without a doubt some of the most attention-getting accents anywhere. Consider adding scented flowering plants to your collection. Check out florist shops and online flower delivery sites. 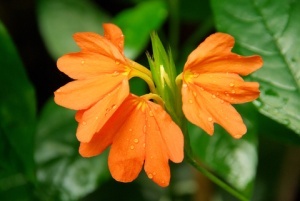 Many exotic tropical flowers have a delightful fragrance. Chinese jasmine plant blooms in late winter with intoxicatingly fragrant flowers. Train it to climb up a trellis or other support to show off its thickly leafed vines and star-shaped clusters of white blooms. 'Sharry Baby' is a sweetly scented Oncidium orchid variety. Oncidiums are often referred to as "dancing lady" orchids because of their distinctive shape and growing habit. Give these dancing sprays of flowers a humid environment with plenty of light and they'll bloom dependably for you. 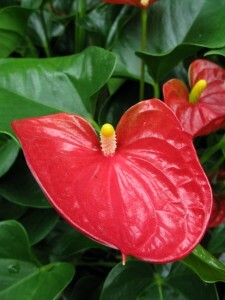 Among the best-known Hawaiian tropical flowers is anthurium (shown at left). Also known as Tail Flower, this exotic beauty features long-lasting red spathes and lush, deep-green foliage. Another island favorite is plumeria. These tropical flower clusters are like fragrant flower bouquets that cover the branches from summer through fall. Get plumeria care tips here. Not to be missed are the big, ruffled blooms of the hibiscus flower. If you live in Hawaii -- or visit -- you'll see hibiscus everywhere. This is the state flower of Hawaii. You can order Hawaiian flowers online. Flower delivery for orchids, anthurium, hibiscus and other Hawaiian tropical flowers is a fast and easy way to grow your collection. Love bromes? Be sure to include Scarlet Star among your tropical exotic flowers. In their native habitat, these epiphytes grow on trees. In your home, they'll grow best in a potting media made up of shredded fir bark. Orchid mix works great. 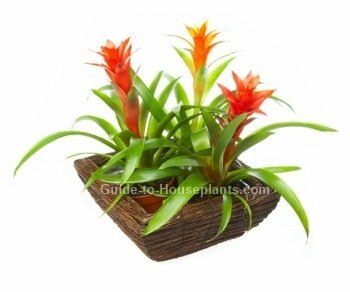 This loose mixture allows air circulation around the bromeliad's roots while also keeping them lightly moist. 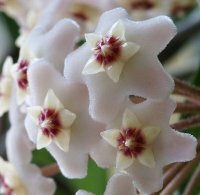 Thickly leaved vines make up the hoya plant, with clusters of blooms showing up in summer that are wonderfully fragrant. Also called wax plant, this tropical beauty is fast becoming a favorite flowering house plant. It's easy to see why. Discover more perennial flowering vines you can grow indoors, plus a few for your sunny patio. Train them to climb a support and you'll add a whole new dimension to your indoor garden. Frilly-petaled Cattleya orchids are often a favorite among orchid lovers. Thanks to thousands of new hybrids, Cattleyas are now available in every color except black. This dramatic house plant is easier to please than many orchids. And that's not all -- you can expect a succession of long-lasting blooms. Want more? 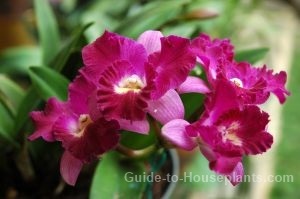 Take a look at the varieties of orchids here. Believe me, you'll be captivated by these gorgeous flowering house plants. 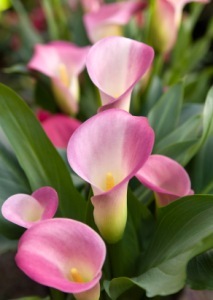 You'll find pink callas at garden centers in spring and summer. Even if you're a novice gardener, you'll have easy success with these undemanding beauties. They'll thrive indoors in a pot if given enough light. You can easily bring them back into bloom every year, too. Pot the rhizomes in winter and you'll enjoy an early show of charming funnel-shaped flowers. Discover more types of lily flowers that thrive indoors here. You don't have to give up flower gardening in the winter. Take a look at these winter flowering plants that are easy to grow indoors. Want to discover how to force spring-flowering bulbs in winter? Get all the how-tos for forcing bulbs indoors here. Did you know you can cut flowering tree branches in late winter and watch them bloom indoors? Find out how to force flowering branches before spring arrives. Put firecracker flowers near a bright window and enjoy their spectacular blooms from spring through fall. Hands-down the most popular indoor flower. And it's no wonder. African violets will bloom nearly year-round when they get enough light. 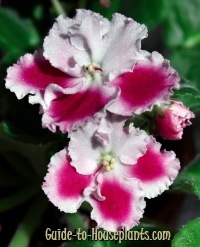 Today's hybrids offer an abundance of new colors, patterns and flower shapes to choose from. Violet-blue still rules, but flowers may also be pink, red, white or any purple hue. Frilly petals, double blooms and miniature varieties only add to their allure.